Shower perches for your parrots! Parrot perches for the shower. A great way to keep those feathers looking bright, healthy and shiny! 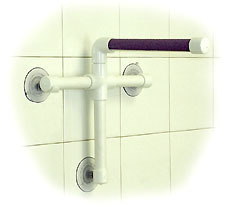 This PVC shower perch has a non-slip, sand coated perching surface and attaches with three heavy duty suction cups. Sanded perching surface is 8" long and perch diameter is 3/4". Recommended for x-small birds, such as Cockatiels, Indian Ringnecks, Small Conures and similarly sized birds. This PVC shower perch has a non-slip, sand coated perching surface and attaches with three heavy duty suction cups. Sanded perching surface is 9.5" long and perch diameter is 1". Recommended for the small birds, such as Pionus, Caiques, Aracaris, Larger Conures and similarly sized birds. This PVC shower perch has a non-slip, sand coated perching surface and attaches with three heavy duty suction cups. Sanded perching surface is 11.5" long and perch diameter is 1.25". Recommended for the medium to large birds, such as Greys, Eclectus, Cockatoos,Macaws and similarly sized birds.